Attention certified divers: Discover some of the best diving sites in the Riviera Maya on this 3-day tour. 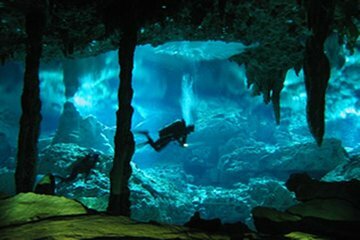 Enjoy two dives along a reef location near Playa del Carmen, a 2-tank dive in Cozumel and another 2-tank dive in cenotes. Admire fascinating rock formations and glide alongside colorful fish and sea turtles. Transportation, meals and all necessary equipment are provided, making this a hassle-free experience.